« Holy Heroes Con, Batman! It’s after 1:00 am on a Monday night and I really need to be in bed. Instead, I’ve stayed up tonight catching up on some of my favorite blogs and coming to the realization that we are 16 days away from Halloween. That’s 2 weeks and 2 days. TWO WEEKS AND 2 DAYS. Two weeks and 2 days away from my favorite day of the year. Yes, I’m holding it up above even my birthday, which is just a scant 2 days after Halloween. I also came to the realization that my favorite season of the year is here and I haven’t written a word about it. Come to think of it, I haven’t written a word about anything in a long time. 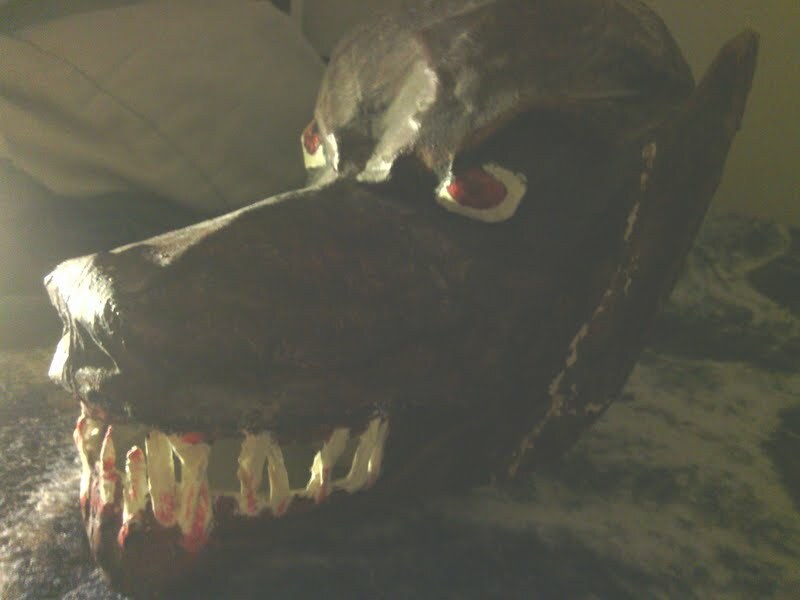 So, for the handful of you who bother to even check in with this thing (and I wouldn’t blame you if you didn’t), let’s talk a little bit about something creepy. And old. And in my bedroom. THIS GUY. He’s a shrunken head. 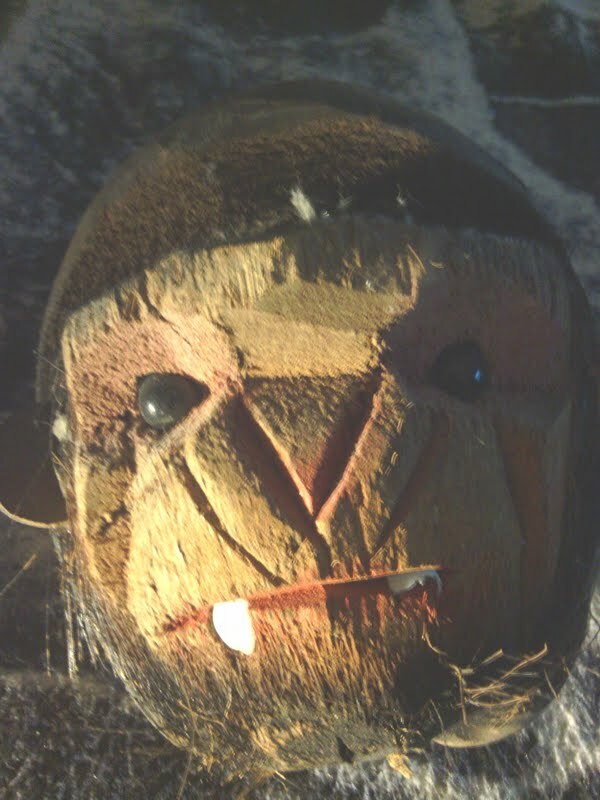 Actually, he’s a coconut carved to look like a shrunken head. 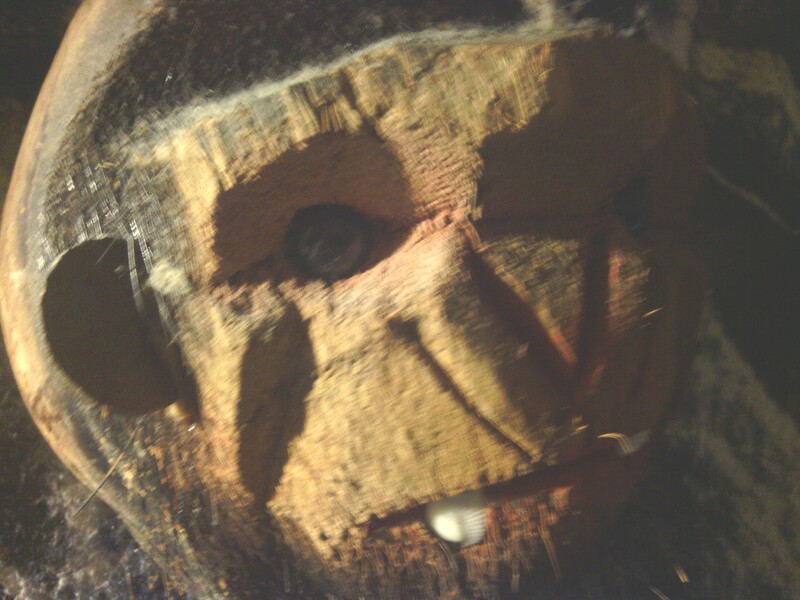 Actually, he’s a coconut carved to look like the shrunken head of a monkey, apparently. 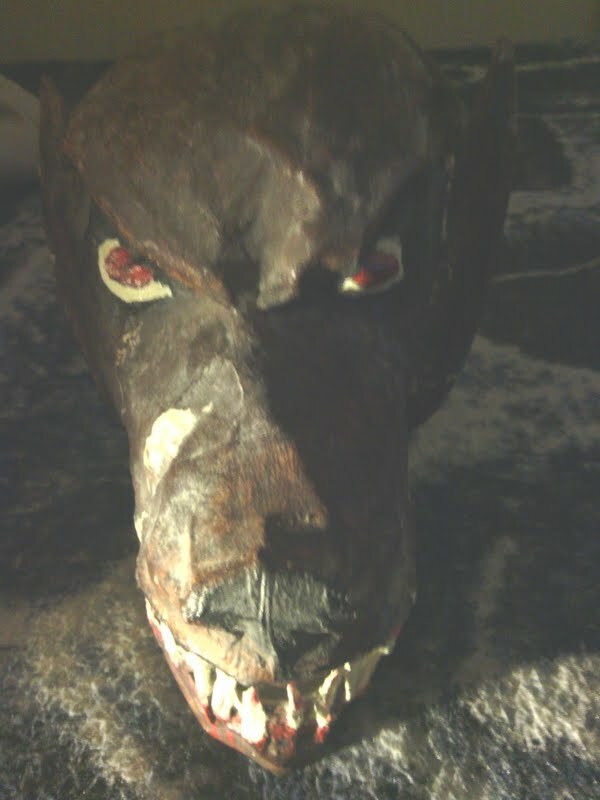 I snagged him in a storage shed behind my grandfather’s house when he died back in 1990. He’s hung above my bed ever since. I’d like to share some further insight into that, but the truth is, I don’t have any. 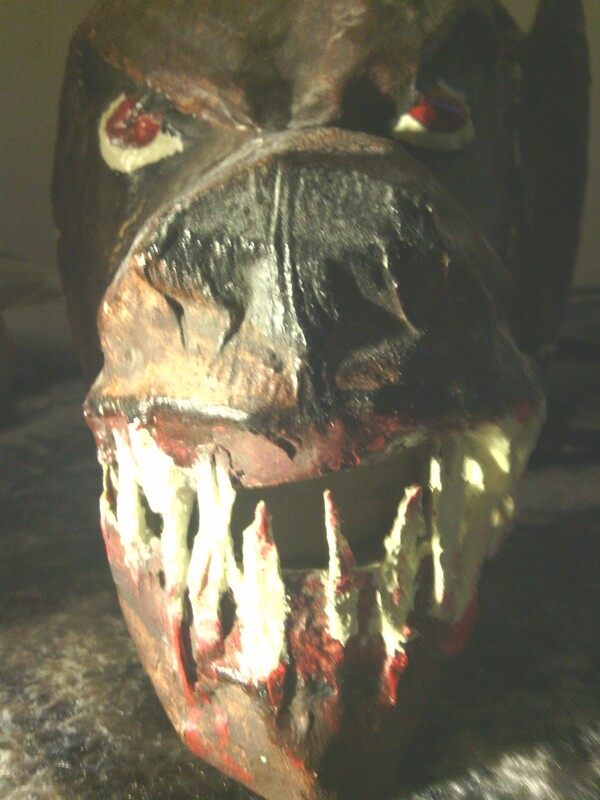 He’s a creepy coconunt carved to look like a shrunken monkey head. It speaks for itself. I don’t have the faintest clue as to where my grandfather got him or how. All I know is that he hangs above my bed every night and that’s creepy enough. Also, you can’t make it out, but the blanket that I sat these on in order to take the pictures is one made up of images of wolves. So, I kind of stuck to a theme there. I ended up going a little gory. Sorry, Ms. Smith. 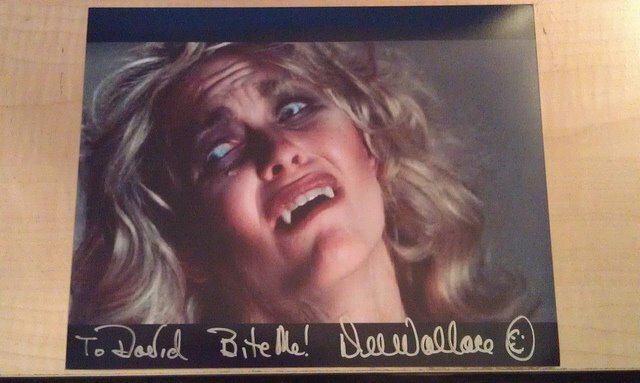 UPDATE: I was going to end things there, but felt I had to mention that for those of you who aren’t in the know (and you need to get yourselves in the know) when it comes to The Howling, the pretty, blonde victim there is Dee Wallace, one of the greatest actresses of our time, and one of the nicest people I’ve ever had the pleasure of meeting. I met her last year at the amazing Mad Monster Party horror convention in Charlotte. Here’s my autograph. She had a lot of pictures to choose from, but of course I had to go with the one from The Howling. And here I am, happy as can be and looking like a total goober. This entry was posted on October 15, 2013 at 1:56 am and is filed under Uncategorized. You can follow any responses to this entry through the RSS 2.0 feed. You can leave a response, or trackback from your own site.